Summer in the city is hot and the humidity can be killer! With the new pup I have not been wearing much jewelry because he tends to think they’re toys and wants to play. I know he has to learn sooner rather than later because I can’t put wearing them on hold forever. I wore this casual outfit for a day of errands, hanging out in the park and lunch outside at a sidewalk table, all of which included Hudson. He loves to take a nap under the table while we grab lunch or a drink at night. NYC is incredibly dog-friendly and he is allowed practically anywhere that doesn’t serve food, aside from sidewalk tables, which is great for us because we want to be with him as much as possible! 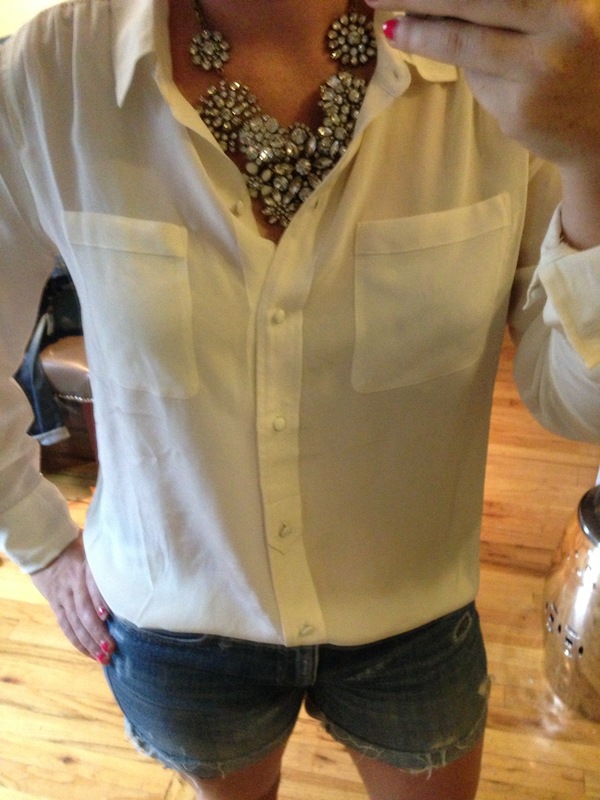 Tank: J.Crew (on sale and worth every penny for the embroidery!) 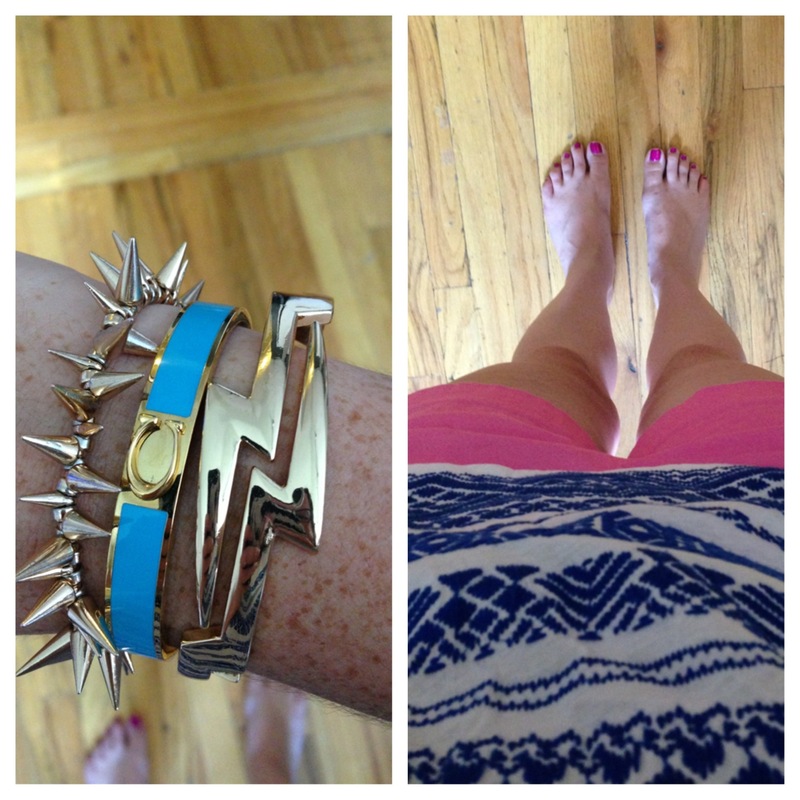 | Shorts: J.Crew (old) similar here | Bracelets: Forever 21, Spikes (no longer online) and Lightning Bolt, C.Wonder, love this one too! Yesterday was weigh in day for Reagan. 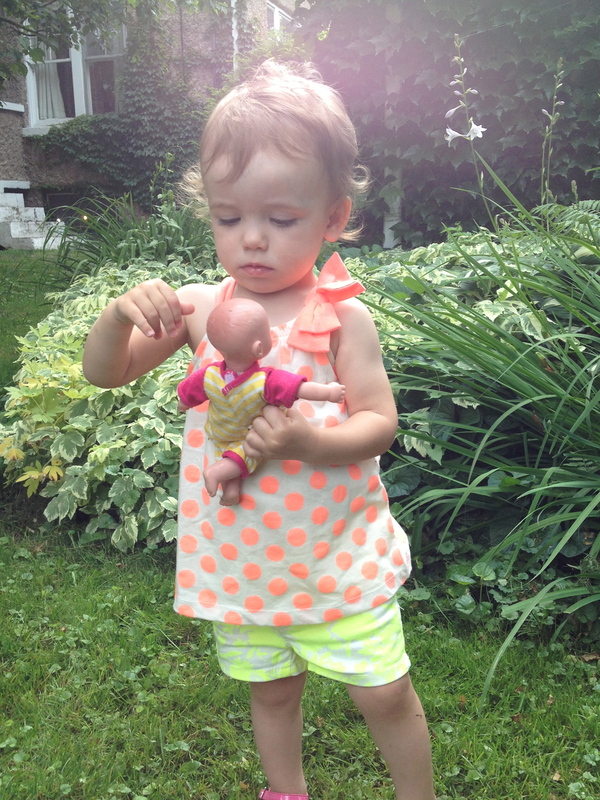 She hasn’t been gaining adequate weight, her growth chart for weight has plateaued when it should be climbing. She’s a picky eater, a snacker and dislikes eating a full meal. My husband and I try everything; last night it was taking turns feeding each other…one for Reagan, one for mommy, one for daddy- with daddy clapping ridiculously after we each took our bites. Some meals she eats fantastically, others…not so much. We offer her everything we eat, plus some. I can’t, however, be a short order cook for my 20 month old. At Reagan’s 18 month checkup, she weighed 22lbs. Yesterday, two months later, she gained a measly 6 ounces. UGH!!! So needless to say she has been referred for Food Therapy. Luckily, she has been refered to a clinic of a friend of my mother’s, so there is some comfort in knowing that we will be in good hands. I’m not 100% sure as to what Food Therapy will entail; I will post on that after her initial evaluation at the end of the month. 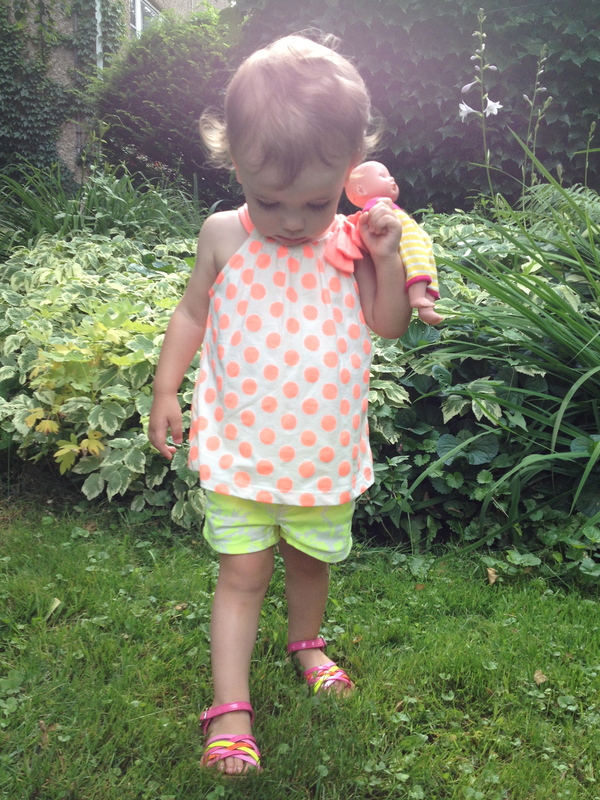 Enough about that and on to these super cute peach polka dots! This top is actually a onsie underneath, which is genius, because it keeps Reagan from taking her top off…which she has been doing lately and always in public- the library is her number one pick for her favorite place to remove her clothing- which isn’t the best place, because the librarians aren’t the friendliest and always look at me like I’m a horrible mother. Nevertheless, we continue to go each week and continue to get the same stares from the same women. You would think that they would just get over it already and find something else to negatively glare at. Neon yellow flowers…yes please! These shorts are a very thin denim, have a button fly and an adjustable waist band. 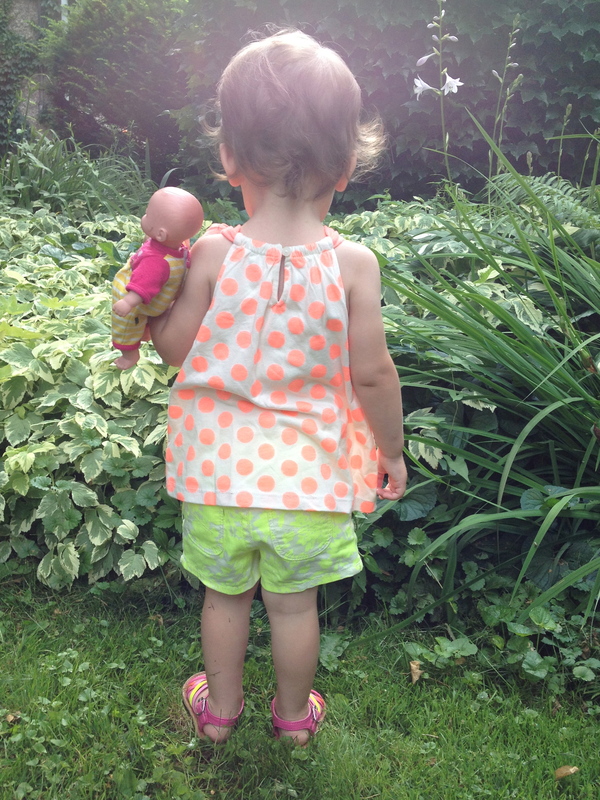 Adjustable waist bands are a dream for my tiny waisted toddler. The beloved Children’s Place sandals. I think it may be time to retire these beauties. For $19.95, they totally have gotten their fair share of ware.